This tutorial will teach you the basics of creating, working in, reviewing, and merging branches using Git and Bitbucket Cloud. If you don't know the Git basics, don't worry just check out our Learn Git with Bitbucket Cloud tutorial and you'll be up to speed in no time. Have several teams working from a single repository concurrently. Have team members anywhere in the world using Bitbucket Cloud to collaborate. Have multiple lines of development running at the same time independent of each other without needing code freezes. Since we want you to feel like you're working on a team, in a common Bitbucket repository, we will have you fork a public repository we have supplied. Fork is another way of saving a clone or copy. The term fork (in programming) derives from a Unix system call that creates a copy of an existing process. So, unlike a branch, a fork is independent from the original repository. If the original repository is deleted, the fork remains. If you fork a repository, you get that repository and all of its branches. Click + > Fork this repository on the left side of the screen. Modify the Name so it is unique to your team, then click Fork repository. The preceding example creates the test-repositories directory using the mkdir (make directory) command and switches to that directory using the cd (change directory) command. remote: Counting objects: 12392, done. remote: Compressing objects: 100% (12030/12030), done. Receiving objects: 100% (12392/12392), 2.72 MiB | 701.00 KiB/s, done. Resolving deltas: 100% (8044/8044), done. Which clones the repository using the git clone command and creates the directory the clone created mygittutorial.git.bitbucket.io. You're going to add a quote on your website in this branch. Create a branch using the git branch command. Check out the branch you just created using the git checkout command. List the branches you have locally using the git branch command. Note: your change isn't committed to the Git history yet it's in a "waiting" state. We learned about this in Saving changes. Commit the change with a descriptive commit message. Note: now the changes is part of the Git history as a single "commit" We learned about this in Saving changes. Push that change to Bitbucket using the git push command. fatal: The current branch test-1 has no upstream branch. You will see an error because the first time you push a new branch you created locally you have to designate that branch. Push the branch and change using the git push branch command. Writing objects: 100% (3/3), 363 bytes | 0 bytes/s, done. This tells the system that the origin repository is the destination of this new branch. When you're working in a team you'll likely have to pull or fetch branches which other team members create and push to Bitbucket. This example will give you some of the basics of creating and working with branches others create. Click Create branch, name the branch test-2, and click Create. Branch test-2 set up to track remote branch test-2 from origin. The branch with the asterisk * is the active branch. This is critical to remember when you are working in any branching workflow. Your branch is up-to-date with 'origin/test-2'. You can see what branch you're on and that the branch is currently up to date with your remote (origin) branch. Your branch is ahead of 'origin/test-1' by 3 commits. One of the most important things to remember when working in branches is that you want to be sure the branch you're making changes to is the correct branch. Now it's time to get your first change reviewed and merge the branch. Click +> Create a pull request. You can see your test-1 branch as the source branch and master in the destination branch. Because we created this repository by forking an existing repository the destination is set to the master branch of the repository we forked. To correct this you will need to change the repository destination branch (the branch into which you will merge your changes) from tutorials/tutorials.git.bitbucket.org to your repository. Make a comment in the pull request by selecting a line in the diff (the area displaying the change you made to the editme.html file). Merge commit—Keeps all commits from your source branch and makes them part of the destination branch. This option is the same as entering git merge --no-ff in the command line. Squash—Combines your commits when you merge the source branch into the destination branch. This option is the same as entering git merge --squash in the command line. Learn more for details on these two types of merge strategies. Click Commits and you will see how the branch you just merged fits into the larger scheme of changes. Now you've gone through the basic branching workflow and your change is in master. The last thing we'll learn is how to delete the branch you just merged, pull the updated master branch, and merge the updated master branch into your test-2 branch. Remember, branching in Git differs from SVN or similar version control systems by using a branches as both long running branches, like a master and development branch, and short term development branches like the examples we use in this tutorial. Because this is the case it's not a bad idea to delete local branches to keep your local environment cleaner. Why pull master and merge it into test-2? We're using this as an example of you working on a repository into which another team member is working. It's a good idea to pull changes into your working branch from time to time to prevent merge conflicts in pull requests. You can see you're on the branch you just used to make your change and that you don't have any changes. We're ready to get rid of that branch now that we've finished that work. Notice that the message says you are up-to-date? This is only your local branch. We know this because we just merged a change into master and haven't pulled that change from the remote repository to our local system. That's what we'll do next. What happened is that when you pull the changes from the remote repository git runs a fast-forward merge to integrate the changes you made. It also lists how many files and lines in that file changed. You can see that it deleted the branch and what the last commit hash was for that branch. This is the safe way to delete a branch because git won't allow you to delete the branch if it has uncommitted changes. You should be aware however that this won't prevent deleting changes which are committed to the git history but not merged into another branch. Switch to the test-2 branch using the git checkout command. The active branch matters. If you want to merge master into test-2 you want to have test-2 checked out (active). The same is true if you want to merge test-2 into master you need to have master checked out. To see what branch is active at any time use git branch and the active branch will have an asterisk or use git status and it will tell you want branch you are on and if there are pending local changes. The Git Feature Branch workflow is an efficient way to get working with your team in Bitbucket. In this workflow, all feature development takes place on branches separate from the main master branch. As a result, multiple developers can work on their own features without touching the main code. This workflow helps you collaborate on your code with at least one other person. As long as your Bitbucket and local repos are up-to-date, you're ready to get started. Use a separate branch for each feature or issue you work on. After creating a branch, check it out locally so that any changes you make will be on that branch. Work on the feature and make commits like you would any time you use Git. When ready, push your commits, updating the feature branch on Bitbucket. 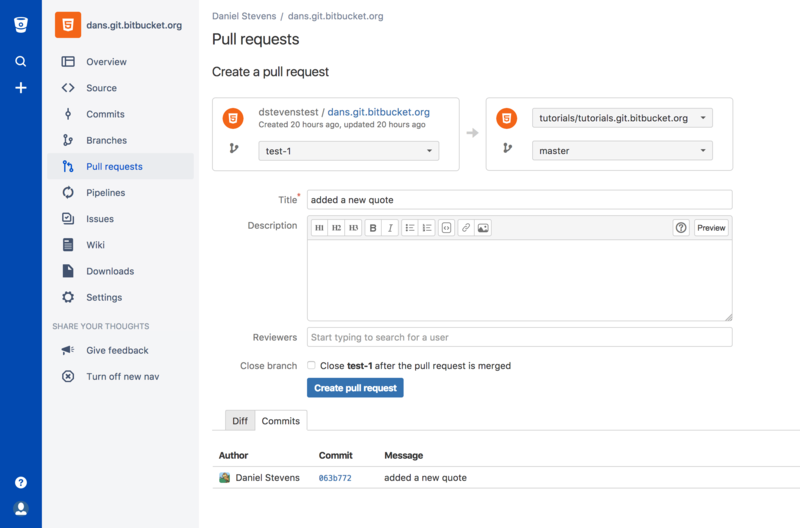 To get feedback on your code, create a pull request in Bitbucket. From there, you can add reviewers and make sure everything is good to go before merging. Now your teammates comment and approve. Resolve their comments locally, commit, and push changes to Bitbucket. Your updates appear in the pull request. Before you merge, you may have to resolve merge conflicts if others have made changes to the repo. When your pull request is approved and conflict-free, you can add your code to the master branch. Merge from the pull request in Bitbucket. This tutorial is limited in it's ability to show how branches make teams more effective. There are several approaches to branching and we discuss some of these approaches in: Comparing workflows.